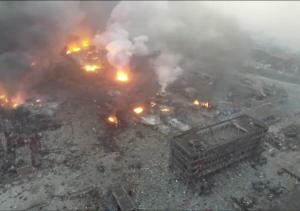 The giant explosions that ripped through the port of Tianjin in China continue to take more lives. Currently, the death toll is 104 people but this total looks likely to increase. At the same time, genuine fears exist over toxic contamination. Therefore, the government of China needs to reassure the population that safety mechanisms will be dramatically tightened. 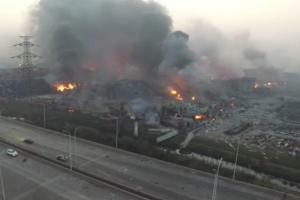 According to various news channels in China, the police are now evacuating a vast area because sodium cyanide was found. It is futile to speculate about the threat and size of sodium cyanide on the site hit by deadly blasts. However, it is clearly essential to evacuate individuals that may be threatened by possible toxic substances. Unlike local authorities, Chinese firefighters have sacrificed themselves at horrendous costs. Sadly, 21 brave firefighters have perished and this number could increase given the dangers that still persist. Yet without their amazing bravery then so many others would have perished. Alarmingly, for local residents, regional authorities appear not to be in full knowledge about the quantity of substances being held at the devastated site. On top of this, a lack of unity between the people and authorities is clearly visible.